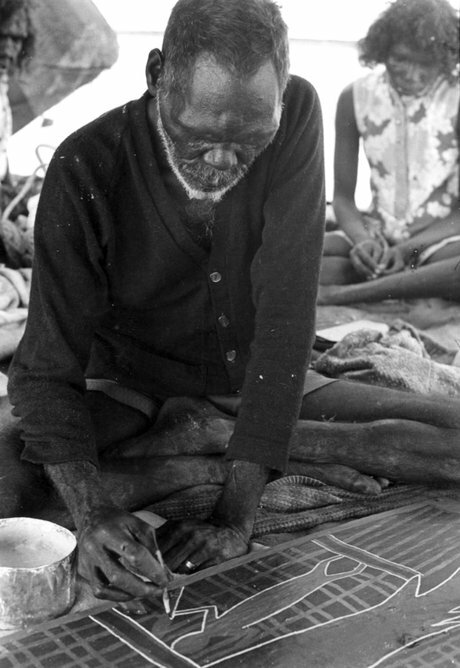 Mäw’ Mununggurr’s life spanned a crucial era in the history of the Yolngu people of north-east Arnhem Land. He was one of the older sons of Wonggu Mununggurr (c.1880–1959), the famous Djapu clan leader who led resistance to incursions on his land before the establishment of the Methodist Yirrkala Mission in 1935. Mäw’ was imprisoned for a year in Fannie Bay Gaol in Darwin following a skirmish at Caledon Bay in 1933 in which the crew of a Japanese pearling boat were killed. During World War II he was a member of Donald Thomson’s Aboriginal observer force, patrolling the shores of Arnhem Land looking for any signs of Japanese invasion. Wonggu, in collaboration with his older sons including Mäw’, painted for Thomson an enormous bark painting of the main settlement site, Wandawuy: Wet season painting , 1942, now in the Melbourne Museum. After the war, Mäw’ settled at Yirrkala, making frequent visits to his country around Caledon Bay and Trial Bay. 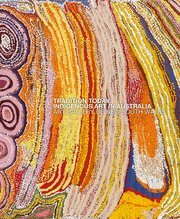 He was a prolific painter, producing works for anthropologists Ronald and Catherine Berndt in 1946 and 1947, and for Charles Mountford’s American–Australian Scientific Expedition to Arnhem Land in 1948. Mäw’ produced bark paintings throughout his life, and during his final years he worked intensely to help his clan establish Wandawuy. Painting for sale was only a minor part of his artistic output. Mäw’ was a great singer, dancer and ceremonial leader, and was frequently called upon to produce paintings of his own clan and his mother’s clan in ceremonies. He was a leader of the spectacular Dhanbul (Morning Star) exchange ceremony – which he depicts in Banumbirr (Morning Star ceremony) , 1948, and The Morning Star ceremony , c.1960 – and took it to Groote Eylandt and Numbulwarr. Mäw’s style of painting is often reserved. Many of his early paintings comprise multiple figurative representations of fish and animals, with broad areas of crosshatching in a single colour. These paintings were in continuity with some of the earlier Yolngu barks representing daily scenes that were among the first produced for the Rev. Wilbur Chaseling, who established Yirrkala Mission. Towards the end of his life, Mäw’s paintings emphasised the story of Mäna, the Djapu shark, and the shark itself often provided the dominant image. He also continued to create the paintings of his mother’s clan, the Munyuku, and related Yirritja moiety clans.